Today in Masonic History Joseph-Michel Montgolfier passes away in 1810. Joseph-Michel Montgolfier was a French inventor. Montgolfier was born on August 26th, 1740 in Annonay, France. He was the 12th child in a family of paper manufacturers, an art form at the time. Unlike his younger brother who he would gain fame with, Joseph had no real head for business and was described as having the temperament of an inventor and maverick. In 1782, it was Joseph who first had the idea of making a balloon. His first thoughts on the balloon came when he was watching clothing dry over a fire. As a portion of the clothing filled with warm air it would begin to rise. It was while watching the fire that he would later claim that he contemplated one of the great military issues of the day, an assault on the fortress at Gibraltar. Gibraltar had proved impenetrable from land or sea, Joseph imagined that a group of soldiers could be lifted up and brought down into the fortress. As Joseph mused about this problem he further believed that the smoke contained a special gas, which he called Montgolfier gas, and which contained the special property which he called levity. Joseph set out building a small model of a balloon with a thin wood as a box underneath a piece of taffeta. When he was successful he contacted his brother immediately asking him to assist in the project. In his message to his brother Étienne he said "Get in a supply of taffeta and of cordage, quickly, and you will see one of the most astonishing sights in the world." The built a device 27 times greater in volume than Joseph's original model. They successfully launched the balloon and immediately lost control of it. It flew approximately 1.2 miles before it crash landed and was destroyed by a passerby. In 1783, the brothers built another balloon and launched in their home town of Annonay. This time the balloon stayed aloft for 10 minutes, flying 1.2 miles and reaching a believed altitude of between 5,200ft and 6,600ft. After their flight in Annonay, news reached Paris and Étienne headed to Paris. Joseph being a shy, reserved and unkempt in appearance remained behind with the family. Despite a claim that a Portuguese priest that he was the one who first invented the hot air balloon some 74 years earlier, most aviation historians credit the Montgolfier brothers with the invention of the balloon. 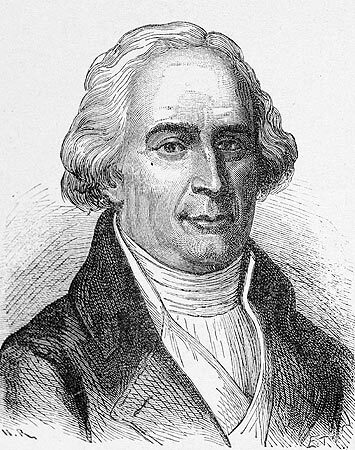 Joseph-Michel Montgolfier passed away on June 26th, 1810. Joseph-Michel Montgolfier was a member of Loge des Neuf Soeurs. He first appears on the membership roster of the lodge in 1806.